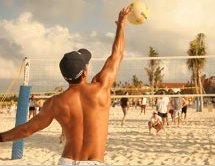 If you have ever wanted to learn how to play beach volleyball or if you have played and want to sharpen up those skills, then the National Beach Volleyball Organization's Spring and Summer Clinics are for you. The Clinics for beginners run on Tuesday Nights at Sorrento Beach in Santa Monica, California beginning Tuesday, April 16th at 5:30 PM. The clinics are open to all ages (under 18 requires parent's signature) and all ability levels. These clinics usually run at a one instructor to six student ratio, meaning you'll get plenty of time with an instructor if you have specific questions. Most of the time, the clinics will split into groups based on ability level. This way, if you are an experienced player and wish to focus on spiking, you will be with players of your ability. Likewise, if you are a total beginner, you can enjoy yourself without fear of slowing the action down. The clinics go through all of the basics of the game and run some fast drills to keep the action and your heart rate moving! Join us the First Saturday of each month at 9:00 AM for a clinic to hone your beach volleyball skills and then play fun competitive games. Looking for a Co-ed League Partner or Team to join, come out and meet your fellow Beach Volleyball Enthusiasts looking to play. Games will be followed with ONEHOPE Specials. Social Saturday's start April 6th at 9:00 AM. Spring Session Tuesday Night Clinics start April 16th at 5:30 PM. Summer Session Tuesday Night Clinics start July 9th at 5:30 PM. Please feel free to call us at (310) 874-3315 or (310) 993-4934 with any questions. Come on out and enjoy some physical activity, meet new friends, and spend the evening on the beach with the NBVO's Spring and Summer Beach Volleyball Clinics.